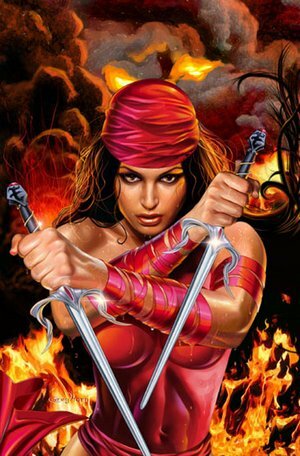 DAREDEVIL Season 2 Casting News - Elektra! At this point in time we now know that Frank Castle/The Punisher, played by The Walking Dead's Jon Bernthal, will be making an appearance in the second season of Daredevil on Netflix. Now there's news that Elodie Young has been cast to play Elektra in the second season of the show. In the comics Elektra was a love interest of sorts with Daredevil, when she wasn't trying to kill him. But that's just a typical love interest complication, right? OK, she wasn't trying to always kill him, but they did have a tough divide in how they operated, considering she was a ruthless mercenary whose trademark sai's were her weapon of choice. She's a Ninja Assassin. That's never a good mix in any relationship. As far as the actress cast to play her, Elodie Young, she has already played a red-garbed, sword wielding killer in as jinx in G.I. Joe: Retaliation. She's also been in The Girl with the Dragon Tattoo and a bunch of French stuff! She has three projects in post-production (a short, Of Kings and Prophets (TV), and Gods of Egypt (movie) ). She's been a regular in a few French television series. I think she'll do fine in the role. There is no other news about the casting, so we'll see how the showrunners play this out. Season two of Daredevil comes out sometime in 2016.